The 1st quarter of 2007 has passed.How time flies! The level of enthusiasm among the children who come to iSmile to do colouring is phenomenal.Especially after we gave away prizes at the end of last quarter. We decided to give away more prizes this time.Yay!! Below are the winners in no particular order.Congratulations!! 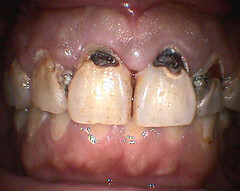 When do we start brushing our children’s teeth? The moment their teeth erupt.It’s never too early to start.The sooner you get your child familiar with the habit of brushing,the less problems you will have in getting your child to cooperate. What if our child refuses to let us brush their teeth? 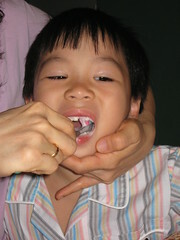 This can be very stressful and frustrating to parents.Allow your child to play with the toothbrush but always supervise.You do not want any untoward accidents.Then tell your child that you will finish up the brushing for him or her.Again,this may take some time before your child actually cooperates and allows you to help.So,do be patient. Children below the age of 7 generally do not have the manual dexterity to brush their teeth well.Therefore,it is important for parents to be aware that the child needs to be assisted when they brush their teeth. You will need to select a suitable toothbrush for your child.The brush should be small enough to fit comfortably into your child’s mouth and its bristles should be soft.There are so many varieties in the market,so we are really spoilt for choice. 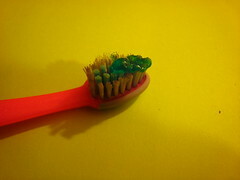 A children’s toothpaste can be used once the child is able to gargle and spit properly.Again,there are several brands of children’s toothpaste available,and if a fluoride toothpaste is used,it should contain not more than 500ppm of fluoride.Use only a pea-sized amount.As much as we are concerned with fluoride ingestion,it does provide good protection to our children’s teeth. The best position to brush your child’s teeth would be to stand behind or beside your child with your other arm gently holding the jaws. How long should we brush?The recommended duration to brush is actually 3 minutes,which is a LONG time.It can be extremely challenging if your child is the normal active,can’t-keep-still type.So,I would suggest you sing a little song,one of those children songs which should take you about a minute or slightly more.You could have one of your child’s favourite songs sung during toothbrushing time. 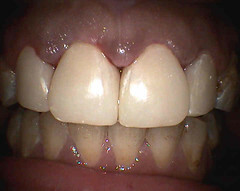 Start by brushing the back teeth,focusing on the biting surfaces where it is usually most prone to decay.Brush the outer surfaces followed by the surfaces in the palate area.Then move to the front and finish up by brushing the front teeth both outside and inside.Use short circular motions to give a scrubbing effect. Get your child to rinse thoroughly by gargling some water and spitting it out.Inevitably,they may swallow some toothpaste in the process,but it is alright as long as they are using children’s toothpaste with very low fluoride content. You can try to floss your child’s teeth from young.Again stand behind your child,or let your child lie on your lap while you floss the teeth which are touching one another. Finally,compliment your child on being so good and cooperative.Tell them how clean and shiny their teeth look.Constant encouragement and praise will raise their self esteem and they will be more interested and aware of their oral health as they grow up.